JPSC Assistant Professor Recruitment 2019: (झारखंड जेपीएससी सहायक प्रोफेसर भर्ती 2019) Jharkhand Public Service Commission has released Online Application forms for the recruitment of the qualified candidates on the 262 posts of Assistant Professor for various subjects. The JPSC Assistant Professor Vacancy Notification 2019 PDF can be downloaded from the official website. The candidates can download the application form from below provided links and can apply for the available PSC Jobs before the last date through the official website. 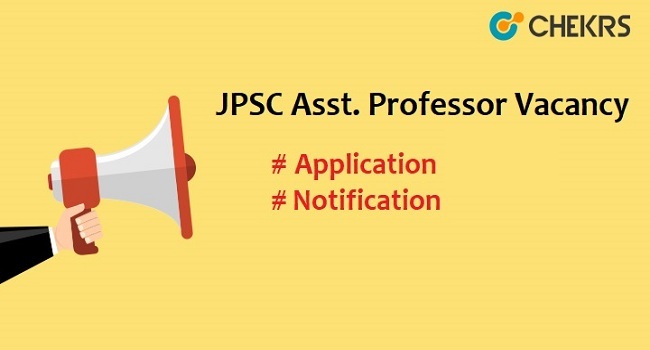 The JPSC Asst Professor online application form available from 08th March to 05th April 2019. Aspirants can check application dates, educational qualification, age limit, application procedure, subjects-wise vacancy, selection process, pay scale and more details in the below article. All the candidates who are interested in applying for Jharkhand Sahayak Professor Bharti 2019 should check their eligibility first and then fill the form under the assistance of following steps. Go to the JPSC official website. Click on the latest recruitment option. Click on the link “Assistant Professor Recruitment 2019 Application Form“. Fill the application form details carefully. Attach the photograph and other required documents. Verify the details and submit it. After successful submission of application form, candidates send a hard copy of the online form before the last date. Aspirants who submitted the application form those are waiting for the interview dates. The JPSC will release the Jharkhand Asst Professor Interview Schedule 2019 on the official web portal. The Jharkhand Assistant Professor Interview call letter will release on the official website. Aspirants can download the JKPSC Asst Professor Interview Call Letter 2019 by using application number & date of birth. Aspirants must carry the hall ticket along with a photo identity proof such as Aadhar Card, Pan Card, Voter ID, Driving License, etc. Candidates without call letter, won’t able to attend the interview process. Remarks: If you are having any queries and doubts regarding JPSC Assistant Professor Recruitment 2019, kindly leave them in the below provided comment box.